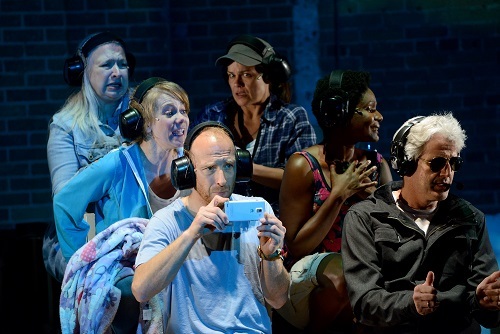 The Watershed, currently onstage at Tarragon Theatre, details playwright Annabel Soutar’s investigation of the Experimental Lakes Area controversy that began in 2012. Using inspired stagecraft and deft performances that recreate real people such as politicians, activists, scientists and her own family, this production dives deep into the tension between economic and environmental concerns. As we begin, Soutar is commissioned to do a piece on the theme of “water” for the 2015 Pan/Parapan Am Games. She involves her two daughters, aged 8 and 10, as an educational opportunity, and her husband acts as her right-hand man. This means family drama crops up, adding a human element to a fairly cerebral theme. Not that the play is lacking in conflict. The action surrounds the Harper government’s defunding of the Experimental Lakes Area, a research facility that studied the aquatic effects of stressors on lakes and their catchments (i.e. watersheds) which then supplies data on a wide variety of environmental concerns, including climate change. Kristen Thomson skilfully plays a determined — if increasingly frazzled — Soutar while the rest of the cast plays an incredible array of characters. Laura Condlin, Bruce Dinsmore, Alex Ivanovici, Tanja Jacobs, Ngozi Paul, Eric Peterson, and Amelia Sargisson all display their ability to switch on a dime, adopting the real mannerisms of people such as Maude Barlow, Diane Orihel, David Schindler, Stephen Harper, Hank Venema, Tom Mulcair, and many many more including various scientists, three children, and even Chris Abraham. Abraham is the Artistic Director of Crow’s Theatre which co-produced The Watershed with Porte Parole, and is also the director of the play itself. While it’s meta-theatrical to include him as a character, it serves a pointed purpose. Abraham asks Soutar to distance herself from Crow’s Theatre as they await a federal arts grant. During the play scientists grow silent in their opposition to the government’s decision for fear of reprisal. Seeing this exact chilling effect on a person invested in the very show we’re watching is chilling indeed. The staging is as impressive as the performances. Projections identify characters, set each scene in a place and a season, immerse us in a room or a vehicle, show us the landscape across provinces, and present the vast oil sands from the vantage of a tiny six- seater plane. Complimenting these are sound effects like typing as Soutar engages in rapid fire emailing, and splashing as the family swims in lakes. The two, together with the physical aspects, create a holistic experience. The set is both rich and minimal. Light wood pieces are moved smoothly into place to portray the interiors of homes, conference halls and Winnebagos, and exteriors of frozen lakes, cottage docks and campgrounds. At two hours and forty minutes, the show does not need to be as long as it is. A dizzying number of successive, rapid scenes gave me little information, but did invoke the sense of the disorientation Soutar felt as she dug deeper into the vagaries of the players’ agendas. It’s possible that the same effect could be induced with a few cuts. I personally would love to see the scene with Jian Ghomeshi, presented without comment as a radio host, to be cut. Ghomeshi was, of course, nothing but a CBC personality at the time, but seeing him represented threw me out of the world of the play, and I had to take a few moments to rein in my emotions about sexual assault. Soutar makes an effort to inject some moral ambivalence to the issue, giving a fair listen to the side of industry and “economic growth.” Her father is a died-in-the-wool Conservative who donates to freshwater preservation — even if it is only for the lake his own personal cottage rests on. Soutar meets with an oil industry leader who has valid complaints about environmental activists, and a couple in Fort McMurray express some lived-experience opinions that are as nuanced as they are authentic. One of the final scenes has Soutar philosophizing with her father about the purpose and effect of capitalism in the world. It’s thoughtful, well-crafted without being pedantic, and of critical importance. This conversation must be had, and decisions made, with urgency as we face the incontrovertible truth of the climate change and the looming spectre of environmental collapse. Tickets range from $28 to $65 and are available online www.tarragontheatre.com, or by phone at 416-531-1827. Discounts are available for seniors, students, groups and arts workers.